Availability: Requires 11 business day lead time before shipping. 2 pack (50 folder) minimum. No returns or exchanges. Add To Cart to view ship rates and delivery dates. 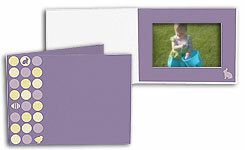 This Purple lilac Easter Photo Folder has a border of polka dots and cute spring icons with bunnies, chicks and eggs. It's a perfect giveaway for mall visits with the Easter Bunny, church events, Easter egg hunts, spring photography, parties & more. Use as is or imprint with your personalized text for Easter or spring baby announcements. Photo Frame Opening Size: 4-1/2" x 6-1/2"
Please note: This item is made to order and is therefore non-returnable. Color selection and imprint location are limited.